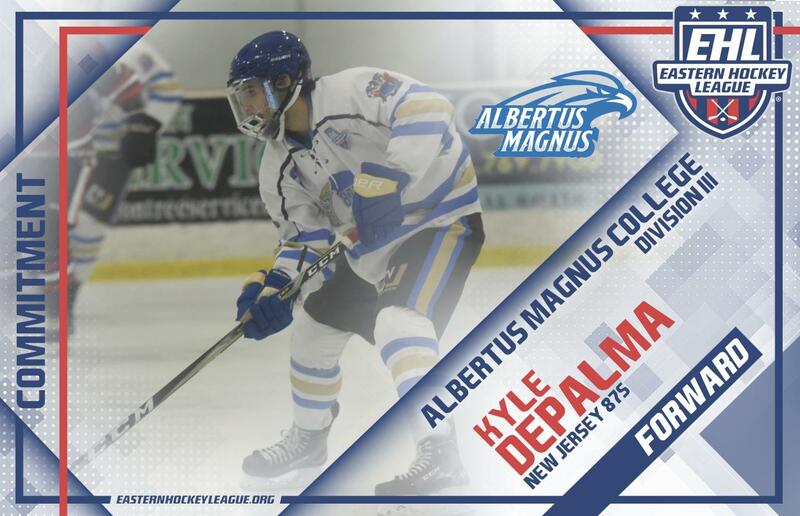 MIDDLETOWN, NJ -- Kyle DePalma, a forward for the New Jersey 87's, has committed to Albertus Magnus College for the Fall of 2019. The '98 is an alum of the Eastern Hockey League Premier (EHLP), where he tallied 37 points in 41 total games last season. This year, DePalma has made the jump to the Eastern Hockey League (EHL) level, and to date, he has racked up 13 points in the first 16 games for New Jersey. "This one is special," said 87s head coach and general manager Adam Houli. "He's a local kid who believed in our vision 2 years ago, and I'm sure he heard some flak about playing in the Premier Division first. He probably could have been playing higher, but he trusted us; He trusted the process, he knew the vision we had, and now 2 months into playing in the EHL he has a commitment." As Houli mentioned, DePalma was probably ready for the EHL last season, but he believed in what the 87s had to offer. This is just the program's 2nd year in junior hockey, and their first at the EHL level. The team is playing well right now, and it's due in large part to the core group of players that have made the jump from the EHLP to the EHL. DePalma is in this group, and he's very grateful to be a part of it. "It's nice to get the burden off the back and just focus on playing hockey," said DePalma. "For being the first commit in 87's history is remarkable because I've been here for a couple of years and it's nice to see that hard work come out and be able to commit early this season. On the ice I think I've become a lot more skilled because I've had so many opportunities to excel. I've had a lot of time to work on things I've been wanting to work on that I haven't been able to work on 2 years prior to this. They have developed me into a good hockey player on the ice and a good person off the ice, so they've really laid a good foundation for me to go to college." It's about more than on-ice talent in the EHL, as our organizations strive to build better men off the ice as well. DePalma and the 87s are off to a great start at 13-3-0 and are now set to take on the Vermont Lumberjacks and the New England Wolves at this weekend's showcase. Learn more about the New Jersey 87's on the team's official website, and check out the EHLP's Commitment list, showing all the players who've climbed the ladder of development.